Pioneers in the industry, we offer telescopic conveyors from India. A telescopic belt conveyor is an effective and economic alternative to labour-intensive routines. Operators can move heavy or light weight packages into or out of the containers/trucks rapidly with little effort. This conveyor gives you precise control at the shipping dock by extending automated loading all the way to the nose of the truck. With extendable length up to 20 metres, telescopic belt conveyors can be used to load/unload any type of loose-loaded cargo-typically parcels, boxes, sacks & tyres. 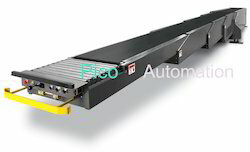 PICO telescopic conveyors are built tough for long life, with heavy duty steel construction and reinforced belt. Controls are convenient and easy to use.